A bus driver has been killed and three others seriously injured following a crash in the Highlands. The 50-year-old man died after the Stagecoach bus collided with a bridge on the B9161, near the village of Munlochy on the Black Isle, at about 17:45 on Friday. Nine passengers were on board when the bus overturned on its side. Three remain in a serious but stable condition while the other passengers suffered minor injuries. The 37-seater service was travelling from Inverness to Cromarty. The road was closed while emergency crews pulled people from the wreckage. Police have urged anyone with information about the crash to contact their non-emergency line. Sgt Alan Henderson of the road policing unit, Highlands and Islands division, said: "Our thoughts at this time are with those involved and their families. "An investigation into the collision is under way and we have already spoken to a number of witnesses. "In order to help establish the cause of the collision, I would urge anyone who saw the vehicle prior to the collision who has not already come forward, to do so. "Likewise, if any motorists believe they may have dashcam footage which could assist our inquiries, I appeal for them to come forward." Earlier a fire service spokeswoman said three fire engines and the brigade's heavy rescue unit were in attendance. She added: "Firefighters safely removed one casualty who was trapped from the bus. The casualty was passed into the care of the Scottish Ambulance Service for treatment. "Five other casualties were also assisted from the bus." 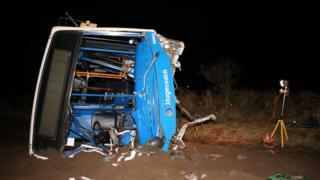 Stagecoach has confirmed that the bus involved in the crash was one of its services. A Stagecoach North Scotland spokesman said: "We can confirm there has been a serious road accident on the Black Isle in the Munlochy area involving one of our services operating between Inverness and Cromarty. "Emergency services are at the scene of the accident. Our first thoughts are for those affected and their families. "Safety is our absolute priority and we are supporting the police and the emergency services in any way that we can, including helping establish the circumstances involved." Kate Forbes, the SNP MSP for Skye, Lochaber and Badenoch, tweeted: "Very concerned and sorry to see this news. Thoughts with everybody involved, particularly those who are hurt."